Fr. 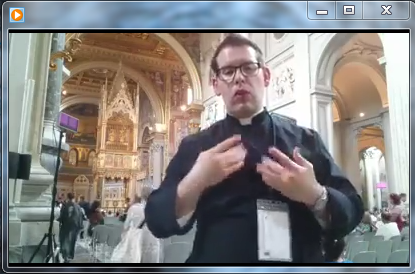 Matthew Hysell is the first Deaf Catholic priest in Canada, and is currently at St. Mark’s Deaf Catholic Community in Edmonton, Alberta. He sends Word&Sign a special message from Rome. Here is a great video about the subject matter of Word & Sign. This little Deaf parish in NY, St. Elizabeth’s, is petitioning the Pope himself in order to keep from closing for budgetary reasons. Look at them, how beautiful they are in their sign language Mass and choir! 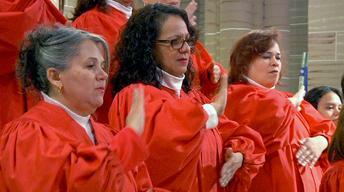 If the Deaf can’t come first in their own historically Deaf parish, what does the gospel mean to the Archdiocese of NY? Must the larger, richer parish down the street always run the show and sweep these devout, long-suffering people into some kind of second-class, off-schedule, “charitable” service? You can find more comments from the reporter at the Huff Post online, here. Happy New Year! It’s been a busy year for me as I continue research on preaching in sign language around the world. 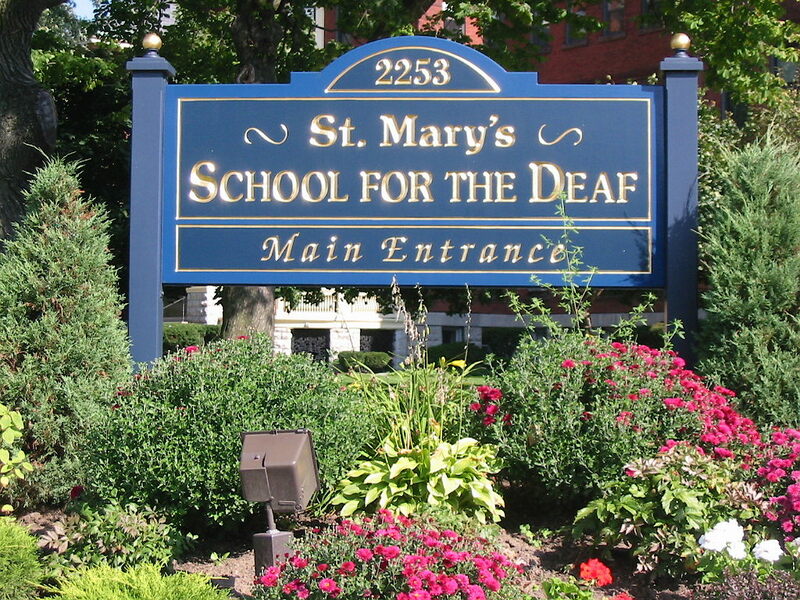 During January I’ll post the fruits of a few of those projects, but in the meantime I will share a teaser from my upcoming article in U.S. Catholic Historian, “‘Shun Not the Struggle’: The Language and Culture of Deaf Catholics in the U.S., 1949-1977.” The title is the motto of St. Mary’s School for the Deaf in Buffalo. Culturally Deaf Catholics in the U.S. define themselves not by their disability but by their shared history, language, and traditions. This article narrates a history of Deaf Catholics from the founding of their central membership organization (the International Catholic Deaf Association) in 1949 to the ordination of the first culturally Deaf priest in North America in 1977. The work of hearing priests and pastoral workers resulted in improved availability of religious education and sacraments in sign language in the 1950s through the 1970s. However, this article argues that Deaf Catholics themselves laid the groundwork which would result in a needed increase in Deaf religious vocations. Other conditions that resulted in the expansion of ministry by the Deaf, for the Deaf include the institution of vernacular Masses after Vatican II, the acceptance of American Sign Language (ASL) as a true language in the 1960s, and the development of preaching in ASL. These conditions set the stage for a core group of Deaf Catholic leaders to organize national camps, Cursillos, and retreats in ASL in an attempt to include this marginalized group in the life of the Church. The article has been accepted for a special 2015 issue on language in Church in North America. It represents several trips to the Deaf Catholic Archives at Holy Cross College in Worcester and abundant (and deeply appreciated) editorial advice from my reviewers. I hope it will invite scholarly dialog on Deaf Catholics as a cultural group with its own history and language conventions, since more perspectives can only improve the small but growing body of scholarship this area. The congregation at St. Augustine signed all the prayers and responses, although the hearing priest, Father Ralph Coletta, spoke and signed simultaneously rather than using ASL. The article goes on to explain that the Deaf considered St. Augustine an essential community center. For the women there was Mary’s Rosary Guild and the men had a Deaf Holy Name Society chapter. The Deaf Catholic community in America was invigorated by the educational and linguistic developments of the 1960s, and the ICDA did not fail to make use of the increasing visibility of Deaf culture. In particular, Father David Walsh, who became ICDA’s official missionary in 1962, led a nationwide effort to establish Deaf services in every diocese. Called “the great Apostle to Deaf people for the United States” in his obituary, Walsh traveled widely, visiting the bishop or archbishop everywhere he went, often with local Deaf lay leaders accompanying him. If there were no priest or pastoral worker assigned to Deaf ministry in the diocese, Walsh would seek the bishop’s agreement to appoint someone. As more chapters were founded in regions across the U.S., the ICDA came more fully to represent the Deaf Catholic community. Between 1961 and 1971, almost 40 more chapters were established in as many cities. These developments after Vatican II begged the question of whether there could be culturally Deaf priests whose native language was ASL and who would therefore be able to communicate fully and directly with a Deaf apostolate. Because the Deaf in America were not at this time aware of any culturally Deaf priest except for the Brazilian Vincente Burnier, Deaf Catholic Americans had never seen a priest who could demonstrate preaching or Mass in native ASL. Not until 1983 would the revised Code of Canon Law eliminate physical defect as an irregularity for holy orders, marking a new era for Deaf men who discerned a vocation to serve their community as priests. It may not be preaching, but Camp Mark 7’s viral video production of Pharrell William’s “Happy” in ASL is one of the most persuasive and spirited works I’ve seen from the Deaf Catholic community. I’m posting it here to spread the love, and also to show Fr. Thomas Coughlin in the video doing his thing with young deaf people. My daughter Lena and I just returned from a full week at this remarkable place, momentous for its role in Deaf Catholic history and culture as well as the Deaf community in general. Thanks to Fr. Tom and Fr. Matthew Hysell, too, for amazing interviews at camp. I can’t wait to write more of the story of this wonderful place and the people who make it what it is. EDITOR’S NOTE: Today Word and Sign publishes our first guest post! The translation below excerpts a 1986 WORLD DAY OF THE DEAF document which offers the best scholarly evidence so far that the first deaf priest was not Fr. Charles LaFonta (1878-1927) of France (as believed until recently) but DON PEDRO VELASCO DE TOVAR of Spain, a student of Don Pedro Ponce de Leon, the sixteenth-century Benedictine abbot and teacher of the deaf. The original translation was graciously contributed by John McLucas, Professor of Italian and Chair of Foreign Languages at Towson University. The document quotes at length a 1986 Spanish-language biography of Ponce de Leon by Fr. 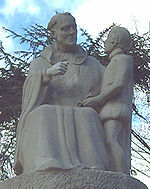 Antonio Eguiluz Angoitia, which references the original diaries and writings of Ponce de Leon extensively. We are in the process of acquiring this book and hope to offer even more conclusive evidence soon. Previously, scholars only mentioned what might be considered a bit of gossip, that a servant of the House of Velasco confirmed that Don Pedro Velasco was certainly a priest who celebrated mass in the estate’s chapel [see T. Labarta de Chaves and J. Soler, Sign Language Studies 5(1974):52]. He would have done this by voice in Latin, as this was the requirement at the time and Ponce de Leon was known for teaching the deaf to speak. However, scholars also indicate that Velasco used sign language extensively as his first language. The emphasis in Deaf Studies scholarship throughout the 1980s and 1990s focuses on Ponce de Leon’s probable methods for educating the deaf and not whether his pupil became the first deaf priest—an astounding thing to overlook from the perspective of Deaf Catholic history. As a final confirmation, Fr. Joe Bruce, S.J., has already written to Rome with a request to find the letter of dispensation for Don Pedro Velasco in the Vatican Library. Thanks also to Fr. Bruce for finding the Italian pamphlet at the Deaf Catholic Archives at Holy Cross College! And now, Dr. McLucas’s translation. I have left his delightfully informative translator’s notes throughout. To all you older students in schools for the deaf, who are about to finish your obligatory school course [in 1986, this was through age 14] and are about to choose the kind of superior school in which to continue your studies, I offer these brief accounts of the lives of seven deaf priests, so that by reading them you may acquire the desire to choose the life of the priesthood, following their example, so as then to put yourselves at the service of your deaf brothers [and sisters]. In Italy we do not yet have a single deaf priest: I hope that one of you, the readers of these pages, may become a priest! Despite what has been previously believed and written, Fr. Giovanni La Fonta was not the first deaf priest; rather, it was DON PEDRO DE TOVAR, the favorite student of Abbot Pedro Ponce de Leon. This information was brought to light by Fr. 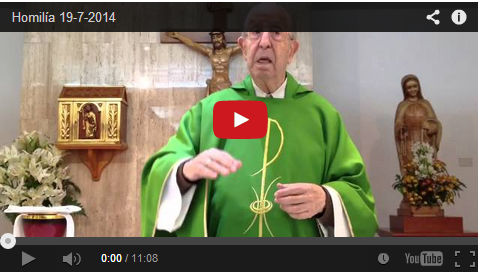 Antonio Eguiluz Angoitia, a Franciscan priest, in his recent work, “Br. Pedro Ponce de Leon – the new personality of the deaf-mute” (Madrid, 1886). Don Pedro de Tovar was ordained priest with pontifical authorization or dispensation. Indeed, being deaf-mute constituted an impediment to priestly ordination, because, it was said, words pronounced orally form the main part of the Sacraments. This was a point discussed in detail by jurists and moralists. It was not easy to obtain the Holy See’s authorization for the first deaf-mute priest. No doubt he was helped by information given by his teacher [maestro – I have rendered this word sometimes as “teacher” and sometimes as “master”; the Italian word maestro can mean “master” in the sense of “teacher,” but not normally in the sense of “owner (of a slave)”.] and the mediation of some monks of Oña who were present in Rome as theologians of the Concilium/Council. Fr. Ponce would have rebelled against anyone who denied the priesthood to his student. Without doubt the day of greatest joy and satisfaction in his career as a teacher of the deaf was the one on which he watched, marveling, as PEDRO de TOVAR went up to the altar to receive from the Bishop the anointing which made him a minister of the Lord. This fulfilled the proverb which says, “God can write straight on crooked lines.” The intentions of the Marquesses of Belanga to consecrate their handicapped children to divine service were also fulfilled in this way, to the great and unexpectable [great word – something which “couldn’t have been expected”] joy of the parents, thanks to the brilliant work of the monk Fr. Ponce, truly a virtuous and wise man. This was only natural: the master had a special affection for the most brilliant of his students. The news of his death, which occurred and the end of 1571 in Medina di Pomar, was a hard blow for him. In his will, the student expresses his wish that his teacher might be with him in his last moments. It would have been the “It is finished!” [Christ’s last words, quoted here in Latin] of such a marvelous work. I wanted to share this .pdf (click the link above) of a new brochure on the contents of the Deaf Catholic Archives at Holy Cross College in Worcester, Massachusetts. Fr. Joseph Bruce, S.J., has been working this year as a special assistant to the archivist. As a result, it should be much easier to find specific materials when I do research this summer for my U.S. Catholic Historian article. I’ll post more later about how great it looks now (no doubt!) compared to what I saw last time I visited.